February 12, 2018 Amy P.
Some people take horoscopes very seriously. I'm a hit-or-miss type on horoscopes, animal signs, personality types, etc. Mostly, when I read these descriptions, I think they're so vague it's easy to read one's personality into the description, and it could likely be molded to fit just about anyone. Now, if there are two words to aptly describe me, perhaps these are it. I am a big-time worrier. I am also observant, down to minute details. Neither of these attributes is good, per se. Worrying is hard on the heart and soul. Some people say worrying is wasted time and energy, but I'm tempted to think it's difficult to really quantify the good vs. bad nature of worrying because we can't really measure the outcome of said worry. So much of what we worry about never happens, or so they say. But what if it never happens because we worry, and that worry leads to certain behavior (subtle and otherwise) that curtails all that badness and stops it in its tracks? You feel my husband's pain right at this very moment, don't you? Then there is being observant. Oh, hand to my heart, is this one a double-edged sword. I notice so much. My husband lives life with a certain amount of tunnel vision. He focuses on the task-at-hand, which can be anything from solving a complicated work problem to eating a sandwich. I'm not being glib here, either. I once asked him, while he ate his lunch and asked me for the second time in a row what we had planned for dinner, "What are you thinking about?" Um....okay. You have to think about that? I was sitting at the lunch table, eating my own food, and thinking about grocery shopping, bedtimes, what needed to be washed for bedtime, if I had time to get the shopping in before naps, whether or not the herb garden in my peripheral vision was going to bloom, dear god...what if the mint takes over again...should I have put it in a separate container? And that was all before I took another bite of my own sandwich. What would like be like to simply think about one thing at a time? A sandwich. I wonder, as I think of all of this, if the Virgo sign has anything to do with any of this at all, or if women, in general, are just more prone to worry and multi-tasking than are men. 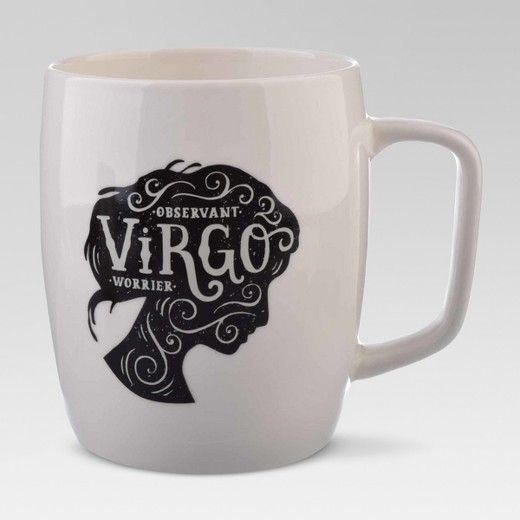 And of course, women are also more prone to perusing the selves at Target, along the mug aisle, where they might see a lovely cameo with two little words that seem to describe her exact demographic. Having said all of that, if it wasn't Frugal February, I'd buy that mug in a heartbeat. My husband would probably never notice the words etched on the side. I should buy it in March and do a little test to see if he'd say a word about it. I might just do it. What is your sign? Do your two adjectives describe you? I hope everyone had a lovely weekend. We spent the ENTIRE weekend in the car driving to soccer games and then in the rain, watching the boys play. Our daughter was a champ about doing all of this, packing along books and blankets to keep herself warm and entertained. My husband and I listened to an Audible book, and our son's team won all four games and the tournament. We ended all of that excitement with a blow-out meal at Olive Garden, which has bloated me right up.